In this Avanti 12 Bottle Counter Top Wine Cooler review, we explore how a dozen of your favorite bottles for special occasions or for regular consumption can be kept well chilled with this 12 bottles thermoelectric countertop wine cooler from Avanti. Extremely stylish and very compact, this single zone cooler’s extensibility allows you to conveniently store up to four of your bottles vertically, which means you can store opened or re-corked bottles without worrying about spillage. 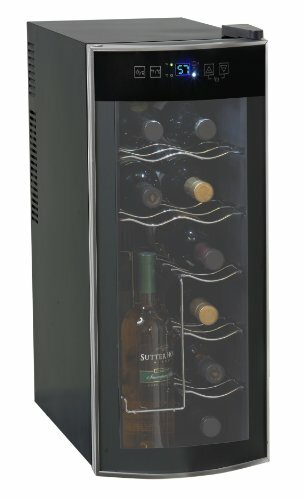 Avanti’s 12 bottle thermoelectric Model EWC1201 cooler epitomizes compact design, featuring a very stylish insulated, double-paned glass door. This gives onlookers an elegant view of 12 of your favorites chilling optimally in very classy-looking chrome racks. A black classic cabinet accentuated with a platinum finish makes this one of the most modern-looking countertop coolers around and it’ll definitely fit perfectly in with any of your ultra-modern or contemporary interiors. This is a lightweight and compact wine cooler that will definitely do well in just about any space, style-wise. 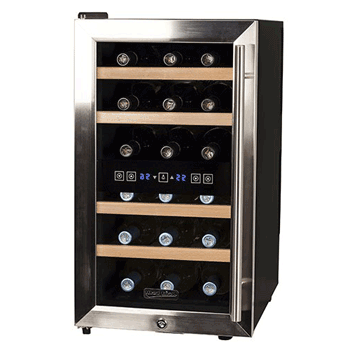 This wine cooler comes with Avanti’s 1 year limited warranty and it makes very good use of its integrated thermoelectric cooling system. In action, this equates to some effective, vibration-free and pleasantly quiet cooling. While thermoelectric cooling is fast becoming a constant in smaller coolers such as this one, this particular wine cooler makes very good use of this cleaner, environmentally friendlier cooling technology. Power consumption is as low as 65W at a voltage of 115V and a frequency of 60Hz. At a weight of 27 lbs and volume (size) of 25.25” (H) x 10” (W) x 20.25” (D), this cooler’s compactness contributes greatly to its very low consumption of power, making it more efficient in this way. This cooler also features a convenient temperature display unit that has easy-to-use soft touch controls to monitor and manipulate the internal temperature as needed. It doesn’t have a lock however and somehow it feels as if that’s something the manufacturers should have found a way to work into the design. Countertop wine coolers are usually preferred by many wine enthusiasts because of their inherent ability to be used as under-counter coolers or freestanding coolers (not necessarily placed on top of a counter). It’s not all that different with this cooler. While you can definitely use it as freestanding cooler (which you might be tempted to do because of its light weight, compactness, and great styling), if you wanted to place it under a counter you’d have to make sure to leave plenty of space on each of the unit’s sides and at the top. This is so that it can ventilate properly as that’s where the ventilators are located. At least four inches clearing space will suffice, but be sure the surfaces which are placed right next to or above the cooler aren’t too sensitive to external heat because this cooler’s vents surprisingly expel quite a lot of heat. This takes nothing away from its power-saving prowess though as it is still very energy efficient. In full operation, you can hear the unit but it certainly isn’t noisy and the sound it makes while running is nothing to write home about. The only separate shelves are the two located at the top of the cooling compartment, while the three at the bottom form one compartment with the vertical storage space. Up to four bottles can be stored vertically, which means that you can conveniently re-chill some opened or unfinished bottles. The single cooling compartment manages a temperature range of 47-64 degrees Fahrenheit and the shelves can be removed as required to create space for bigger bottles, but this naturally limits the overall capacity in a quite a significant way because of the default arrangement of the shelves. 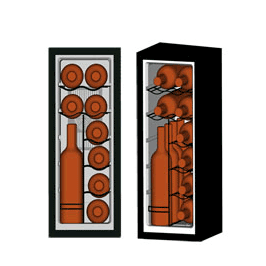 In many ways, this wine cooler was built for wine enthusiasts who love to have a nice selection of a few of their wines chilled and ready for decanting, either for some occasional consumption or for regular entertaining. Set it to a temperature of 56 Fahrenheit and you can then store both reds and whites as this is a temperature that’s acceptable for the varieties. Keep in mind though that this cooler’s internal temperature is affected by the air temperature of its surroundings, so make sure the room in which it’s located isn’t warmer than 76 to 81 F, otherwise, your whites will get warmer than their optimal temperature of maximum 56 F.
This cooler gives you the ability to store some opened bottles in the upright position, a feature most other wine coolers don’t have. Taking into account this cooler’s overall appearance, size and capacity, and the convenience it offers, it would be hard not to be satisfied with it. It is indeed a machine that is dependent on the room’s ambient temperature, with the capability internally cooling within 20 to 25 F of the room temperature it’s housed in. It definitely does the job as intended, but is probably not intended for the storage of some of your delicate varieties. 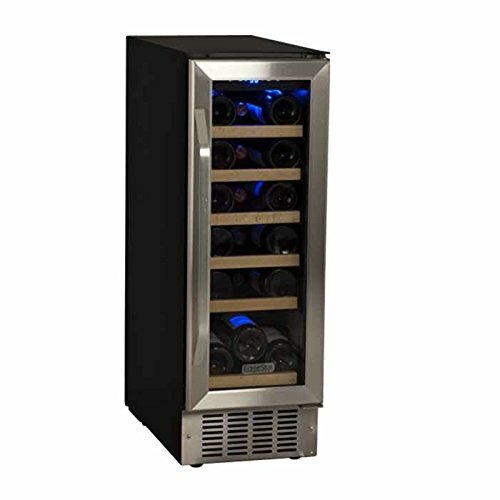 Our most relevant takeaway from putting this Avanti 12 Bottle Counter Top Wine Cooler review together was that if you set the temperature to 56F you can extend its capabilities and store both your white and your red wines in the single temperature cooling zone.